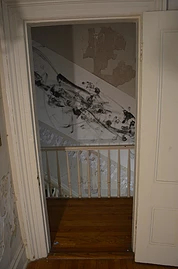 This work was created during the WoW/UNY Governors Island Residency. 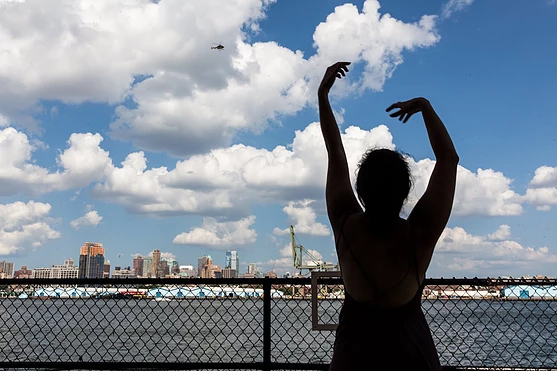 Christina Catanese was in residence on Governors Island from August 6-19, 2018. 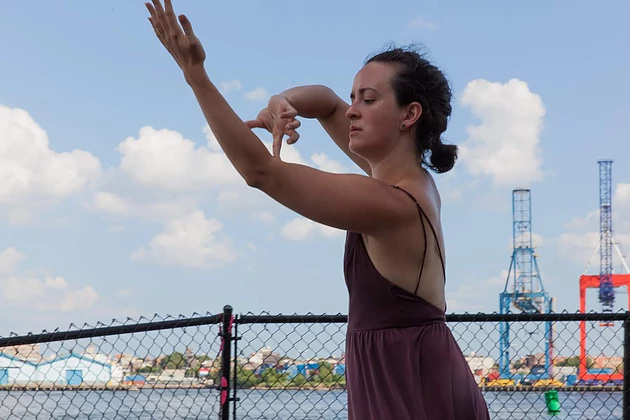 Artist Statement: This choreography was developed in response to explorations and research on the waterways of New York—their histories, pathways, and how we think about their futures. 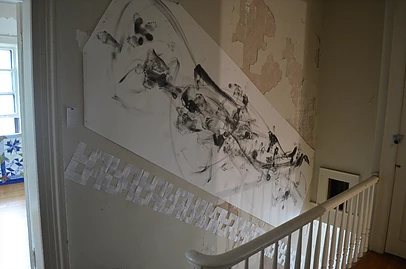 The choreography and drawing are part of a larger body of work, TRACES. 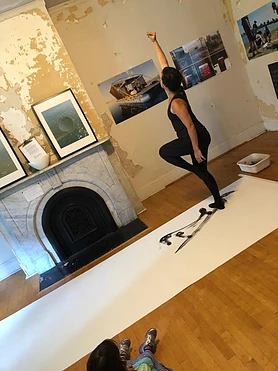 Through site-responsive movement, these performance projects unpack ideas around the interface of human and natural boundaries while channeling the dynamic equilibrium that water seeks. Rivers and streams are constantly changing course, redistributing energy and carving new paths. In a parallel way, dance movement pathways are also not fixed, with some slight variations every time a choreographic phrase is performed. 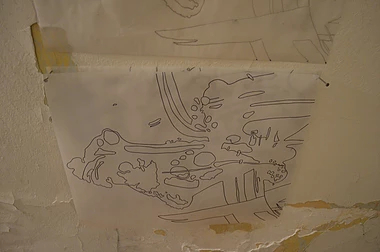 This series of choreographic works uses stream dynamics and river morphology as a point of departure that, when performed, create large drawings as an artifact of the dance, mapping the unique signature of each performance and, abstractly, the water body that inspired it. I also developed new methodologies for site-responsive dancemaking with roots in scientific methods. I developed, tested, and used this method during my residency, and some of the movement in the piece above came from this practice. 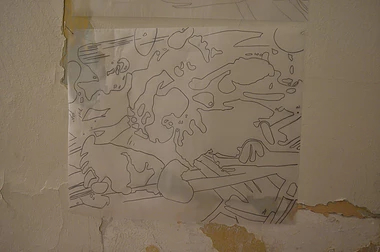 Images of my process are below; a description of my methodology can be found here. 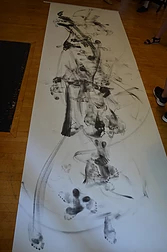 Created during public performance on August 12, 2018. 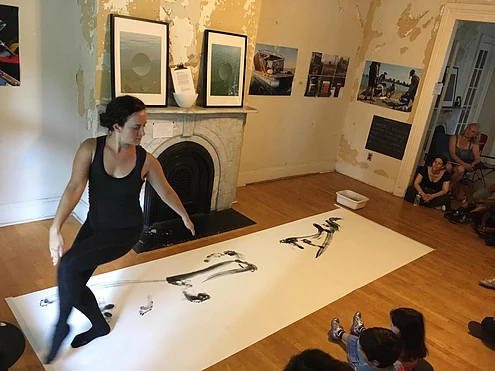 Christina Catanese works across the disciplines of dance, education, environmental science, and arts administration to inspire curiosity, empathy, and connection through creative encounters with nature. 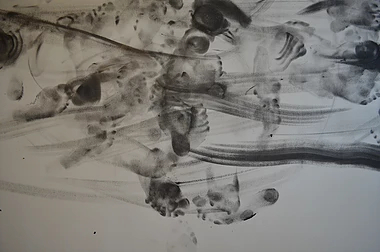 As an artist, she has participated in residencies at the Santa Fe Art Institute, Signal Fire, Works on Water, and SciArt Center, and has presented her work throughout Philadelphia and the region. 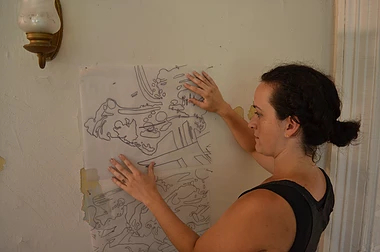 As the Director of Environmental Art at the Schuylkill Center for Environmental Education, Christina oversees all aspects of creating and implementing an environmental art exhibition program in the nature center’s 340 acres of forests, fields, and gallery spaces. Attending University of Pennsylvania, she has a Masters in Applied Geosciences and a BA in Environmental Studies and Political Science.